The Boro, one of the largest new developments transforming Tysons, almost didn’t happen — at least not in the form that it’s coming together now. More startlingly, it was also a fight to keep the nearby Tysons Biergarten alive for a transfer to a new site. This article was written by WTOP’s news partner, TysonsReporter.com, and republished with permission. At Bisnow’s Tysons State of the Market event last week, several of the developers working on the Boro and surrounding projects met to offer a behind-the-scenes look at the project. According to Gary Block, chief investment officer for developer The Meridian Group, some of the earlier development plans would have brought new developments online as soon as they were completed, but Block said they decided it was more important to open the development in a series of larger-scale phases. SUBSCRIBE TODAY | Like this article? Read more by subscribing to TysonsReporter.com’s newsletter today. The project also has funding support from the Rockefeller Group, though there was some initial hesitation about investing in Tysons. 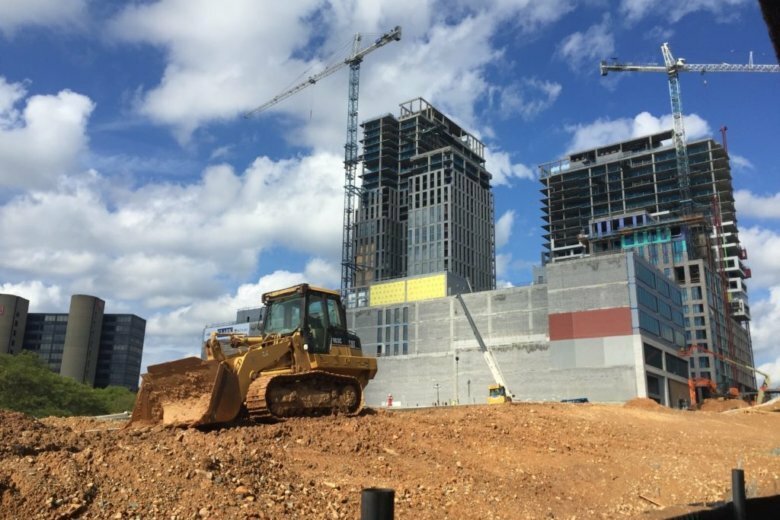 Several developers at the event recognized that developing in Tysons can be a gamble, especially with a portion of the site dedicated to costly residential units. Block said the announcement that Whole Foods would be moving in as a ground-floor retail anchor was a turning point for the development, one that cemented confidence from other investors. Now, Block says the final retail spots are starting to fill up. But one of the pieces that almost got lost in the shuffle was the Tysons Biergarten, one of the few bright spots of Tysons’ nightlife. Donna Schafer, managing director for Cityline Partners, said finding a new home for the Biergarten was more of a challenge than she expected. The Biergarten would eventually land at Cityline Partners’ Scotts Run development, but the permitting for finding that new space was more of a challenge than Schafer had initially expected.